Trenbolone Enanthate 200mg x 10ml. GYMLABS.NET (Great quality EU made oils with fast and safe delivery). If you are looking for ways to bulk up, then there is probably no better steroid as efficient as trenbolone with enanthate ester. The anabolic effect associated with this drug is almost five times to that of testosterone. It virtually exhibits identical pharmacokinetics thus providing its peak release within the first few days of its injection, followed by decreasing levels for approximately two weeks. The base steroid trenbolone, a derivative of nandrolone, exhibits strong androgenic and anabolic properties. 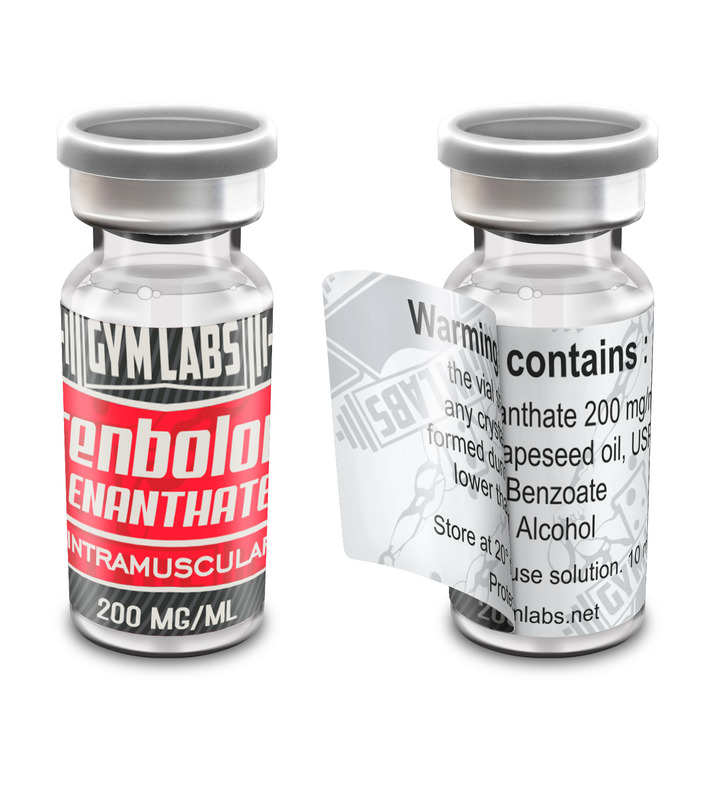 Trenbolone Enanthante does not convert to estrogen; nonetheless it displays notable progestational activity that may exhibit estrogenic side effects. This potent androgen is well suited for rapid buildup of muscle mass and strength, usually delivering exceptional results within a comparatively shorter period of time. With an active half life of about 8 days, this steroid has the longest half life amongst all Trenbolone forms. You could easily manage with a single injection per week. But for maintaining stable levels, two injections every week or one in every four days can be a lot more efficient in terms of performance enhancement. Common doses for men that use it for performance enhancing and physique building purposes can be anywhere between 150 and 300 mg per week. Continuing drug use for about 6 to 10 consecutive weeks can effectively bring out desired results. For building muscles and burning fat, this drug is really great. Bodybuilders are going to love this stuff and it’s also used in majority of pre content cycles. Athletes, however should avoid it as the steroid greatly reduces cardiovascular output probably because of prostaglandin induces bronchial constriction. Apart from nutrition efficiency, Trenbolone is among the finest steroids that promotes two most customary anabolic steroid traits of nitrogen retention and protein synthesis. Another big factor is that Trenbolone Enanthate increases the rate of release of IGF-1 (Insulin-Like Growth Factor-1) much faster than any other anabolic steroid. The enhancement in red blood cell production takes place at an unbelievably high rate. Furthermore, it also reduces glucocorticoid hormones commonly called as the stress hormones. As is with majority of anabolic steroids, Trenbolone enhances your total metabolic rate. By binding itself firmly with androgen receptor, it directly promotes lipolysis (fat loss). Several potential side effects are seen to surface with injection of this substance. Common androgenic side effects include oily skin bouts, facial or body hair growth and acne. Male pattern hair loss can be slightly aggravated also. Severe liver toxicity is also a cause of concern that bodybuilders abusing trenbolone may develop. Hepatoxicity is also developed in persons taking up this drug especially with very high doses. It can also adversely effect triglycerides and blood pressure, increase the risks of mayocardial infarction and cardiovascular disease as well as reduce endothelial relaxation. Trenbolone Enanthate is also seen offering strong negative impacts on male endogenous testosterone production. Women who use this product may experience virilizing effects that include menstrual irregularities, voice deepening, facial hair growth, clitoral enlargement or alterations in skin texture. For obvious reasons, this product is generally not recommended for women. Great stuff!! I stacked the tren with some sus and I started my cycle at 170 and jumped all the way up to 190lbs. Was very lean and clearly had mass. Probably one of my best cycles I've done. Always good quality. Cant wait to buy again.